The aging Mandarin Oriental could envy the RItz-Carlton's facelift, but the St. Regis and Fairmont dazzle. SAN FRANCISCO (TheStreet) -- Some think of them as just for rock stars and royalty, those penthouse suites -- the biggest, glitziest rooms a hotel can offer, some with private rooftop outdoor spaces surprisingly rare in San Francisco and therefore even more impressive for personal parties, business meetings or romantic getaways. But some of the best discounts in recent memory are being placed on these high-end rooms, a result of fewer VIPs and hotels looking to fill vacancies. It becomes just a question of which San Francisco suite is the best. 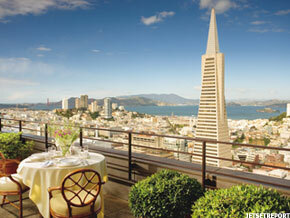 BEST VIEWS, BUT DON'T LOOK AT THE ROOM The Mandarin Oriental is on the upper floors of a high-rise in San Francisco's Financial District, walking distance to the eateries of the Embarcadero and shops of Union Square. Valets trimmed in royal red and mandarin collars and attentive front desk staff welcome guests inside a dark and cavernous lobby -- but that's pretty much the end of the illusion. The fornt desk is next to MO Bar, which has an on-the-fly sushi bar and tapas menu but rather drab interiors that probably benefit from the lack of much natural light. Two elevators service the hotel, which begins on the 38th floor, but they require patience. Visitors should beware the entry-level rooms closest to the elevator. While each has a plush king-size bed, the rooms are afflicted with a hodge-podge of architecture; one window; and an entry-area closet with too few hangers for even an overnight bag and just two nine-inch drawers for storage. But the room was the cheapest available on a $250 weekend special; a request for a bigger room costs $60 more and brings incredible city views will make you overlook the dated settee with its heavily picked fabric, cherrywood furniture so scratched it looks like it survived a fall off the 42nd floor and wheeled chair that looked like it was dragged from a cubicle on TV's The Office. A rendering from San Francisco's Mandarin Oriental hotel suggests its terrific view -- but not some lackluster accommodations in an aging property. "This is the oldest hotel in the Mandarin Oriental collection, and the entry-level rooms really haven't been touched much in 23 years," the perky desk clerk explains. A recent upgrade included mostly top-level areas such as the Oriental Suite -- more than 2,002 square feet of posh city pad roughly doubled by a dramatic bay-view outdoor space that could be the best in the city if decorated with something other that a synthetic rattan bench and four-seater table. THE MOST EXCLUSIVE The Fairmont San Francisco is a Nob Hill icon and the preferred address for dignitaries and first-time visitors, who come by the busload to see the hotel's baronial park-front facade. Accented with columns, it exudes that quintessential San Francisco vibe. There's also a dramatic marble lobby, but the Fairmont's signature flavor lies in quirky details, including the Tonga Room, one of America's truly iconic bars with its floating stage and Polynesian decor. The Fairmont harbors another secret: Select suites offer wrought-iron terraces, including on a three-bedroom Moorish-inspired penthouse that's the priciest in town. For those on any semblance of a budget, Main Building Terrace Suites are your best option. Expect creamy color palette walls and clubby '50s decor, colorful, geometric-patterned carpeting, a stark living room and separate bedroom with king-size bed with swag fabric canopy, and French doors opening onto an east-facing covered terrace with substantial wrought-iron dining table and lounge chairs. A LITTLE SOMETHING DIFFERENT While the Presidential Suite at the St. Regis San Francisco dazzles with Christofle silver at a 10-seat dining room overlooking Yerba Buena Gardens, and the Mark Hopkins has its own terrace suites atop the famed Nob Hill high-rise that is home to Top of the Mark lounge, the Morgans Hotel Group's ( MHGC Clift Hotel brings a more urban vibe to the city. Home to the exclusive Redwood Room and walking distance to local galleries and shops, the Clift is a landmark for the under-40 set looking for a lobby of moody lighting, Starck decor and beckoning music. It also opens its celebrity-frequented Private Apartment to VIP travelers. The Private Apartment is lined in the same wood paneling as the iconic Redwood Room, accessed through a long and dramatic hallway under 10-foot ceilings. The interior suite is divided between a large living area and a mirrored 12-person dining table. The living area pops to life with a collection of white leather sofa, modern artwork and bronze side tables, while the dining area comes with room-service catering and a dapper butler to serve it. While outdoor space is nonexistent, and views are street scenes in lieu of skyscraper panorama, the decor and styling fulfill design snobs who may sniff at the old-world details of San Francisco's other luxury penthouse pads. RITZ-CARLTON'S BLING IS BACK Ritz-Carlton recently completed a $12.5 million renovation that's emancipated it from horrid floral interiors and returned many of suites and common areas to a fashionable hotel aesthetic. The hotel's almost top-of-Nob Hill location near Chinatown features an iconic facade of stately columns, lobby with Ritz Bar and stately Club Level Lounge with food and beverage service throughout the day. Entry-level rooms are done up in soothing creams and beiges with sunburst mirrors and marble-topped dressers, although there is still the occasional misstep, such as the Lladro-looking table lamps in select rooms. Presidential Suite 910 hits the mark, though, with obligatory separate living, dining and bedroom, 1,200-square-foot outdoor balcony and such ingenious details as an in-room espresso machine, hefty Bulgari bath products, cashmere throws and personal wine cellar with sommelier on speed dial.